Reports of US plan to establish demilitarized Palestinian state, divide Jerusalem, lead Sovereignty Movement to call on PM to stand strong. The Sovereignty Movement, which works to promote the application of Israeli sovereignty over Jewish communities in Judea and Samaria, responded with shock to the unconfirmed reports circulating in the world press about the Trump plan for a settlement of the conflict between Israel and the PLO. The movement expressed the hope that if the reports are true, Prime Minister Netanyahu would have the strength to stand up to the Trump administration’s “tough love”, but also warn against any disastrous plan of this sort, which would bring about the division of the Land and the establishment of a terror state in its heart. 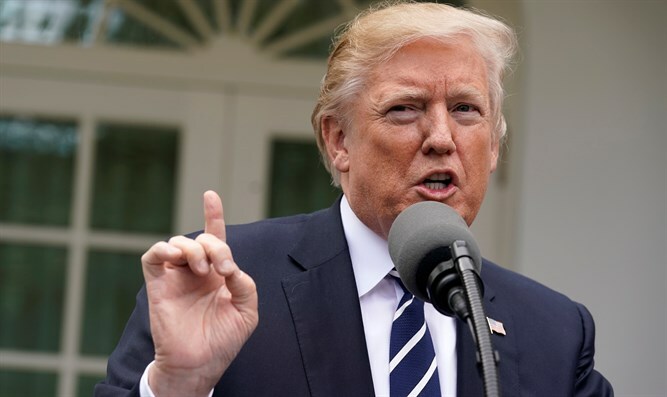 The report was first published in the Arab press, in the newspaper Asharq al-Awsat (“The Middle East”, in Arabic), which presents the main points of the Trump plan, according to unnamed French sources. There is no source given for the report nor is France a close confidante of Trump. However, it claims that the American president will present a diplomatic plan including recognition of a Palestinian state not based on the ’67 lines, while the Jordan Valley will remain in Israeli hands, the Palestinian Arab demand for a "right of return" will not be implemented and the "Palestinian refugees" will be compensated and remain where they are. The alleged plan also states that the large Jewish communities in Judea and Samaria will remain in place but some of the smaller communities would be evacuated. The Palestinian state would be demilitarized and have limited sovereignty, with Israel responsible for the external security envelope of Judea and Samaria and Egypt connected to the external security envelope of the Gaza Strip. It includes the transfer of other security and administrative responsibilities to the Arab authorities in Areas A and B. The capital of the Palestinian state would be in eastern Jerusalem, and the Old City would be given a special international status that would place the Holy Basin in international custody. The heads of the Sovereignty Movement, Yehudit Katsover and Nadia Matar, reacted to the report: “The People of Israel expects, at this time, to see leadership both from Prime Minister Netanyahu and from the entire Israeli government. The people, who saw how Netanyahu was able to stand firm against the Obama administration and his disastrous proposals for eight years, also expects Netanyahu to stand firm in the presence of 'tough love' from the Trump administration, which is considered to be extremely warm toward Israel”. They add, however, that “if Heaven forbid, Netanyahu allows such a diplomatic plan to proceed, this would mean that Netanyahu would be the one to divide Jerusalem, he would be the one to establish a Palestinian terror state in the heart of the Land and he would be the one to miss the historic opportunity that is presented to him”. “If the French reports are correct, that agreements have quietly been made between Netanyahu and others, allowing, even if silently, this dangerous diplomatic channel to exist, then these are the things that justify investigation, and not nonsense like champagne and cigars”, say Katsover and Matar. “Netanyahu must come to his senses and make it clear to his American partners in these discussions and to his friend President Trump that an Arab state in the heart of the Land of Israel would bring disaster upon the State of Israel and would totally undermine the security and economic stability in the entire region. If he does not do so, he will see us in the streets and there will be thousands more who will say to him, 'Mr. Prime Minister, You have gone too far!' "
It should be noted that according to said unconfirmed report, Trump intends to present his plan at an international conference that will be held in one of the Arab states, apparently Egypt, in which representatives from Israel will also take part.